Madonna turns 60 today – Happy Birthday, HRH Madonna! To celebrate, I thought I would resurrect my much-loved ‘Scent a Celebrity Series’, in which I ‘scent’ (pick fragrances for) some of my favourite celebrities. So let’s jump right back in with none other than the Queen of Pop! Madonna; no other name is more instantly recognisable and no person is more likely to divide opinion. Arguably the most famous woman on the planet and factually the best selling female recording artist of all time, Madonna is a force that is hard to define; singer, dancer, performer, entertainer, provocateur, feminist, business woman, calculating she-devil – love her or hate her, whatever moniker you throw at her will most likely apply. She has done what many other icons fail to do – achieve longevity and on her 60th birthday, we celebrate her phenomenal four decades in music. The fascinating thing about Madonna is that her ratio of talent to fame is perhaps slightly off balance. She’s not the greatest singer or dancer in the world, or even the best looking, but she has that je ne sais quoi that makes a person a star – the x factor, as they call it. Some say that she’s just a good business woman and I’m sure she is but that does not make for such longevity. By pushing people’s buttons and having something to say (and saying it well) Madonna has ensured that she is more than a just a star, she’s that rare commodity: an icon. If you haven’t seen the Maysles Brother’s 1975 documentary ‘Grey Gardens’, please click the following link and come back you have educated yourself. You’re welcome. In lieu of watching the film, I shall provide a quick summary. Grey Gardens was (and still is) the name of the East Hamptons mansion once owned by the Bouvier Beales and inhabited by the mother/daughter duo that was Big Edie and Little Edie. After many years of neglect, both the Edies and the Grey Gardens estate were found to be in a dilapidated state, and in need of lots of care and attention. After a load of hoo-hah in the press and calls for their eviction, along came the Maysles brothers who spent a number of months documenting the lives of these two reclusive, yet utterly eccentric women in this strangest of settings. Grey Gardens the movie, is the result of their labours. 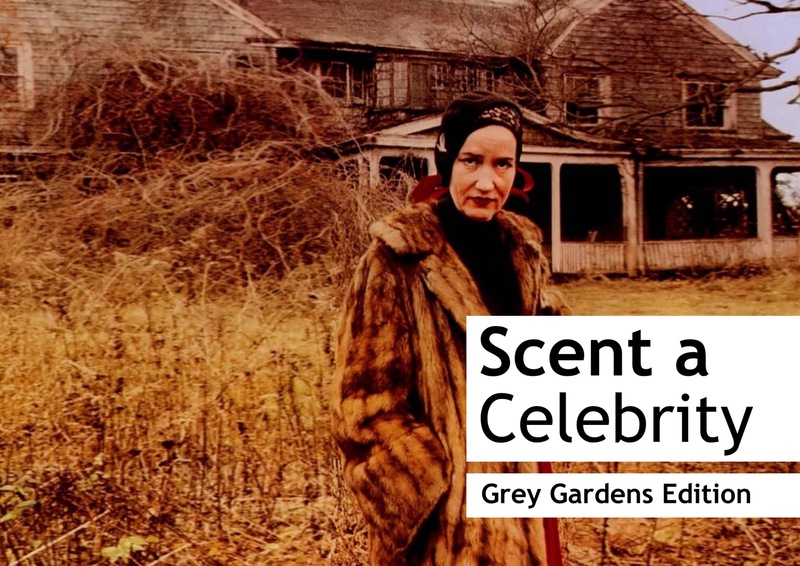 Grey Gardens has become a cult classic over time with Little Edie, who is easily the star of the show, remaining a fashion icon long after her death. There’s tons of memorable quotes (“he always compliments me on the way I do my corn”, anyone?) and fun moments, but the overarching feeling is one of sadness. Watching Grey Gardens, the sense of loss both Big and Little Edie feel for their past life, wealthier times when they were members of New York’s high society and not shunned shut-ins, is palpable. It’s safe to say that the longing for the glory days and the constant rumination over missed opportunities, and what could have been, is painful to watch, but the Edies have a strong sense of survival, and they get through. As Little Edie would put it, they are ‘staunch characters’. That’s ‘S-T-A-U-N-C-H’. Let’s scent them. It occurred to me the other day that it had been a long while since I put together an instalment for the Scent a Celebrity Series. 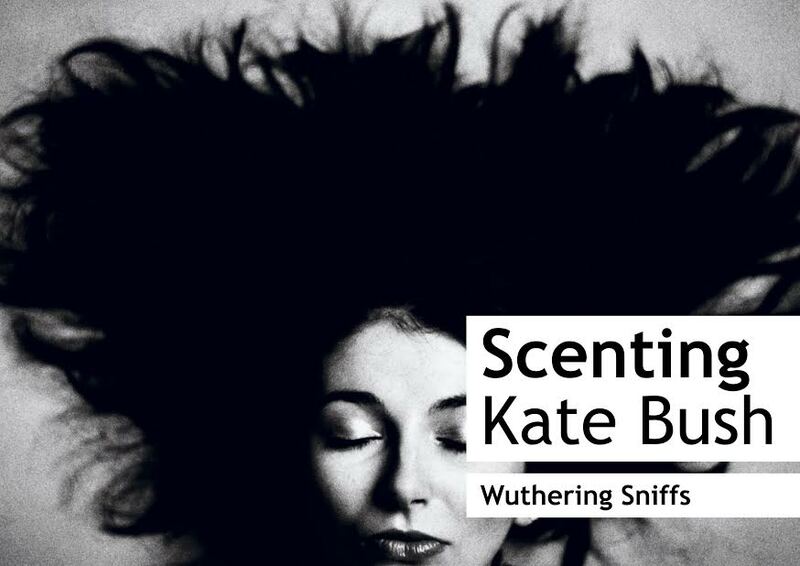 In fact, a quick search of the blog tells me that it was way back in February when we last took a dive into the world of scent selection for celebrities. That is too long, if you ask me. How else are the celebrities and fictional characters of this world expected to navigate the perplexing domain of fragrance? 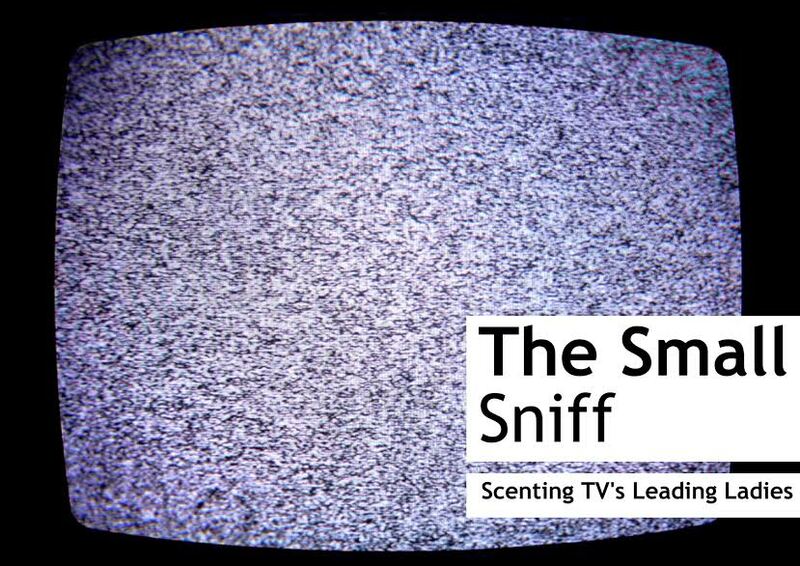 They can’t scent themselves, surely not? No, they can’t. So let’s remedy that with a brand new instalment of some long overdue celebrity scenting. For this edition I am heading into the magical, mystical and ever fascinating world of Studio Ghibli. Creating some of the very best Japanese animation ever, Studio Ghibli has entertained children and adults across the globe, breaking language and cultural barriers with their stories of love, childhood fantasy, strength and suffering. Director Hayao Miyazaki has created iconic characters that are loveable, loath-able, and all that’s in between. 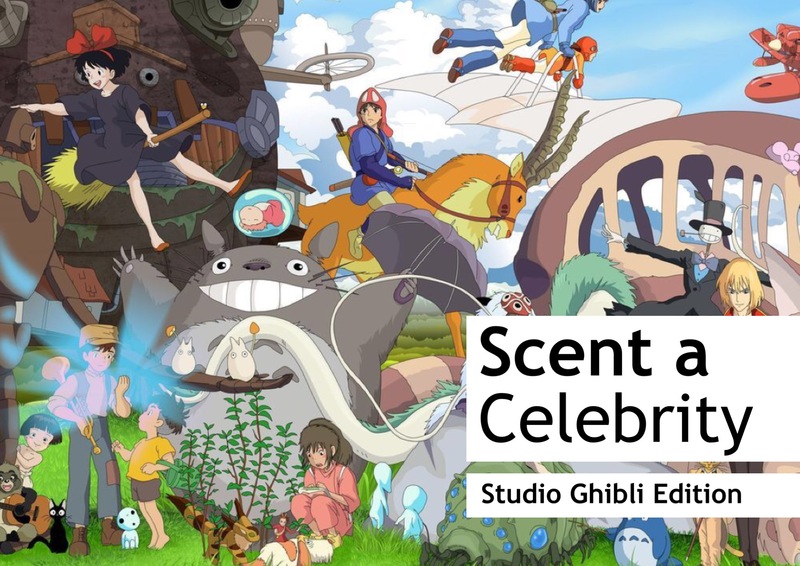 In this piece you will find some of my favourite Ghibli characters from a range of my favourite films – all of them scented to perfection. I’d be lying if I said that the Scent a Celebrity Series wasn’t one of my favourite things to write. There’s just something about the challenge of trying to match a complex personality or character with the olfactory signature of a perfume. Sometimes the choices seem obvious or easy, but on other occasions these scented picks can range from the downright tricky to the marvellously obscure. Challenging or not, the Scent a Celebrity Series intends to be a bit of light, fragrant fun. For this latest instalment in the series, I’m taking a look at some of television’s leading ladies. Over the last few years TV has risen to match, and even surpass the quality of film, creating a wealth of fascinating and entertaining shows for hungry eyes to feast upon. This means that we’ve also seen some exceptionally real and complex female characters on the small screen too, and that is never a bad thing. In this post you’ll find some of my favourites, along with a slew of scented companions. I always enjoy writing entries for the Scent a Celebrity Series. It’s seriously fun and challenging to try and delve into a character and pick out fragrances that I think can match their personalities. This process gives me a greater understanding of not only the celebrity in question, but also the fragrances I have matched with them, and I always coming away feeling as if I’ve seen things from a slightly different angle. As you may or may not know, I have a penchant for picking perfumes for hapless celebrities. There’s just something so satisfying about getting down to the nitty gritty of a celeb’s character and seeking out a fragrance that matches or compliments them. In my Scent a Celebrity Series I have perfumed; The Muppets, The Royals, The Disney Villains, Björk, Nicki Minaj and Lady Gaga, just to name a few. I simply love a good celebrity perfume match, it’s true. For my Escentual column this week and in honour of their recent wedding, I have scented Kimye. That’s right, my scented picks have been plucked for the one and only Kanye West and Kim Kardashian. Think what you want about these two, but you cannot deny the power these two celebrities hold over the media and legions of gossip-lovers. So click here to read my wedding perfume picks for two of the most iconic (and not necessarily most important (although I do think Mr. West is very talented)) celebrities of our age. Like most people on this fine Earth, I love Disney. Yes, I accept that they give one false expectations of love, romance and the presence of talking tea cups, but I’ve found my Prince so all is forgiven. It’s not the Disney Princesses or Princes that interest me though, for it is a simple fact that the pleasant and saccharine things in life aren’t necessarily the most captivating. Instead I have found myself loving the devious, the dastardly and the down right depraved spirits that are the Disney Villains. 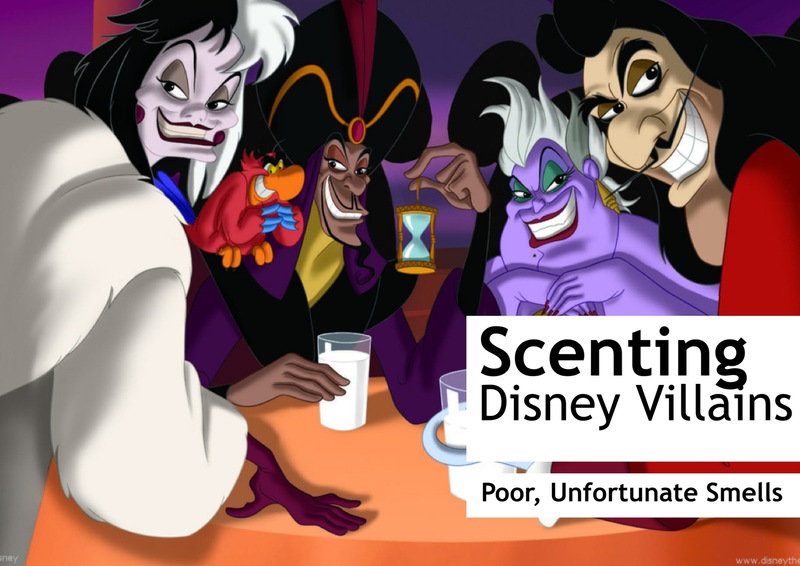 For this episode of the Scent a Celebrity Series I am assigning perfumes to four of my all-time favourite Disney villains, ranging from the squid-y sashay of Ursula the Sea Witch to the campy hypnotism of Aladdin’s arch nemesis, Jafar. So read on dear perfume lovers and Disneyphiles, but do proceed with caution, as these villainous perfumes may appear as innocent cartoon follies at first, but deep down they are nothing but trouble.